While Venom never worked for me as a comics character, it really doesn’t work for me as a live-action presence. The face looks like a hard plastic mask with a computer-generated tongue. I’m crossing my fingers that director Ruben Fleischer (Zombieland) intends to refine the VFX a lot before the film is released. 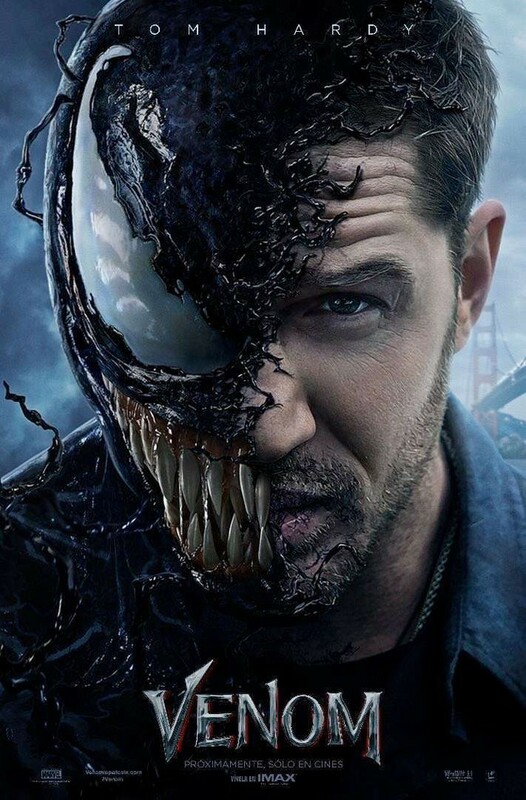 Star Tom Hardy is a terrific, Oscar-nominated actor and the best part of this trailer, but his experiences in genre films have been hit-and-miss. His version of Max Rockatansky in 2015’s best movie, Mad Max: Fury Road, was great and his turn in 2010’s Inception was excellent, but Hardy also played another garbage comic book baddie, Bane, in the highly flawed The Dark Knight Rises (2012). Oscar winner Michelle Williams is also in this — but then again, Halle Berry did Catwoman (2004) after winning her Academy Award, so shiny statuary is no guarantee of quality. Not that Venom looks Catwoman bad; it’s just not inspiring confidence right now. This entry was posted in Comic Book Movies, Film, Superheroes, Trailers, Video clip and tagged Eddie Brock, Michelle Williams, Ruben Fleischer, Sony, Tom Hardy, Venom. Bookmark the permalink.